Directions — Monkish Brewing Co.
|| Heading SOUTH on WESTERN AVE.
Exit 405 freeway and then heading SOUTH on Western Ave. In about 1 mile, you will see the cross street Del Amo Blvd. On that corner you will see a Fastastic Cafe restaurant. 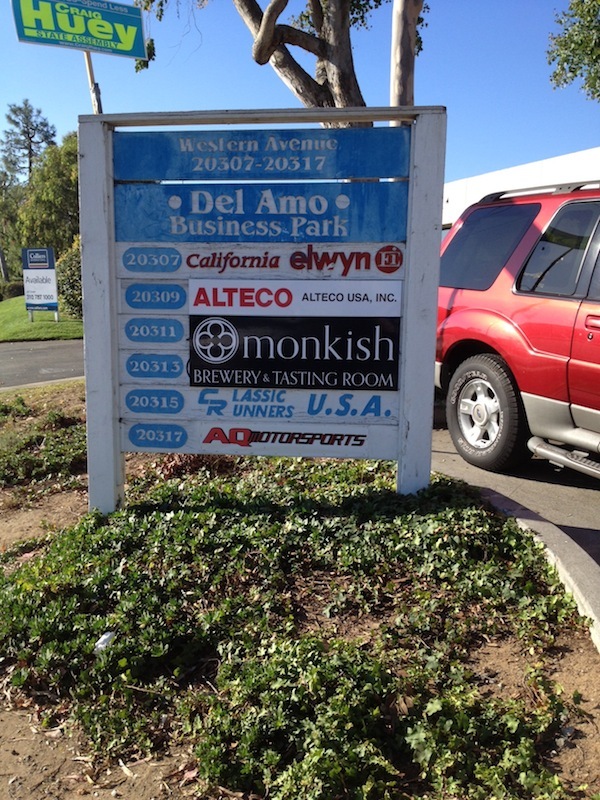 At the NEXT DRIVEWAY after the Cafe, make a RIGHT in the DEL AMO BUSINESS PARK. We are part of the second building. || Heading NORTH on WESTERN AVE.
As you approach Del Amo Blvd, you will NOT be able to make a left turn into our business park. So at Del Amo Blvd. carefully make a u-turn. At the NEXT DRIVEWAY after the Cafe, make a RIGHT in the DEL AMO BUSINESS PARK. We are part of the second building.